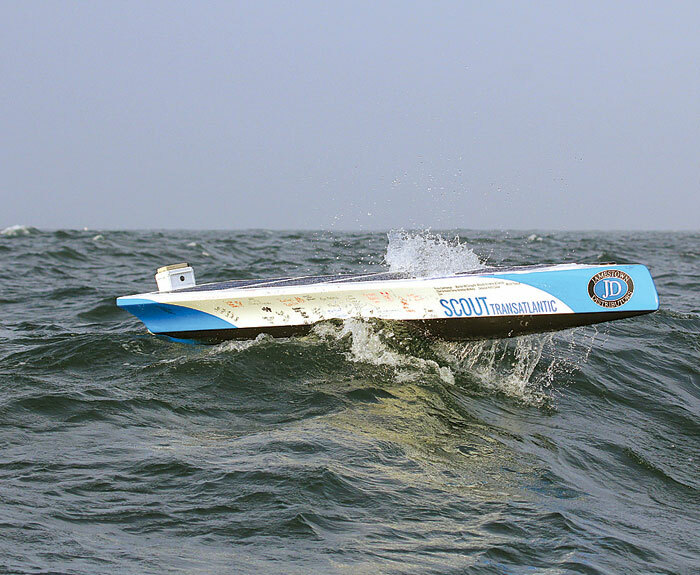 TIVERTON, RI (LOG NEWS SERVICE) — Scout, a 12-foot autonomous robotic solar-powered boat that has traveled more than 2,000 miles since it left Tiverton, Rhode Island Aug. 24 — in an attempt to cross the Atlantic to Spain — appears to be adrift and moving fully with the seas. The bad news was posted by a member of Scout’s shore team on its website Oct 11. “Scout appears to be adrift and moving fully with the seas, at this point,” the announcement said. “It has had a couple of sunny days to recharge — if these systems were working. The best guess at this point is some sort of electrical or software failure on board, with the Arduino processors. Scout was designed and built by a group of young college students to cross the Atlantic relying on pre-programmed commands and information that it can collect about its environment through sensors. Although it transmits information back to shore via satellite, it doesn’t receive commands from shore. Scout was programmed to navigate via a number of waypoints to keep the boat on track. However, due to a bug in the waypoint handling code loaded on board, Scout had skipped many of the waypoints that it should have navigated to before it began to sail southeast on Oct. 7. Although it does not appear that Scout will complete its voyage, the trip has already made history. Dylan Rodriguez, one of the project team, said that as far as he could determine, the previous record for a robotic boat cruise of this type was just 61 miles. The progress of Scout can be monitored online at gotransat.com/tracking/.